Continuing my quest to use (or at least try) all my nail polishes, and in honour of the fact that we've had something that can actually be called a summer - which I have no doubt now jinxed, sorry! 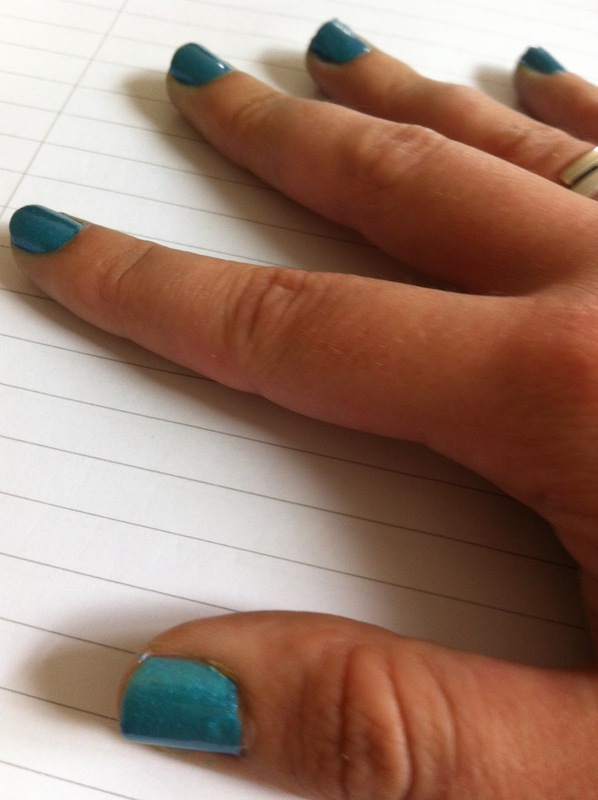 - I decided that today felt like the day to try Andrea Fulerton Nail Boutique Colour in Eliza, a beautiful shimmery aqua blue which (I think) is named after the pop star Eliza Doolittle. Incidentally, if you haven't heard her new song, 'Big When I Was Little', you should - it's a 90s childhood in three awesome minutes. I'm actually really liking the photo on the notebook background, I think it looks pretty cool. I'm currently trying out a few ideas for new backgrounds for my nail pictures so please let me know what you think of them! 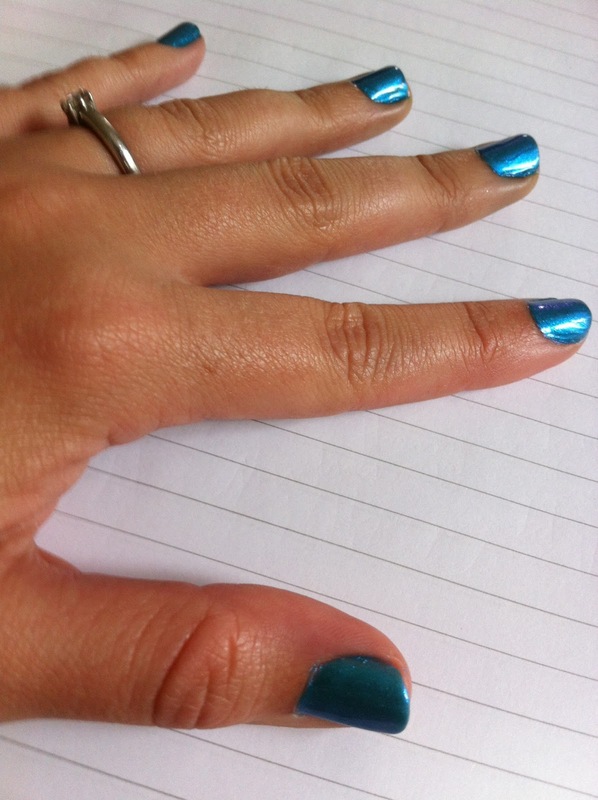 First of all, I love, love, love this colour - it's a beautiful shade of blue. I actually think this is a really good dupe for Chanel Azure - certainly based on the photos I've seen of the latter it seems to be pretty similar colour-wise. It also has a fantastic duochrome effect where it looks much more purple in certain lights. I like the fact you can build it up as well - the photo on the right is with three coats, the photo on the left is with two, and you can really see a difference in the colour as it gets more intense with each coat but still gives a good level of coverage and sheen with two. In terms of coverage, I actually found this polish to be pretty good; as you can see from the second photo it looks pretty decent with two coats, although I think I prefer it with three just because I like that richer more intense colour. The formula was a little bit gloopy, but I think that might just be because I've had it for a while so will add some Seche Restore to try and thin it out a little. Durability-wise, it was really good - I did this on Saturday morning and there was tip wear on Tuesday morning, but the first small chip didn't appear until Thursday and there were no big chips by the time I took it off next Saturday, so I'm quite impressed with that! Overall: beautiful colour, decent formula and coverage, so a good little buy to keep the summery mood going - I think it'd look fantastic on toenails with white or silver sandals, or in the sand on a beach somewhere. Highly recommended. If you fancy trying Eliza you can pick up a bottle at Superdrug for £3.99, which I think is an absolute bargain for such a good quality polish in a lovely shade. What do you think of this colour? Have you tried any other Andrea Fulerton polishes? What's your favourite blue polish that you own? Let me know in the comments, and have a great day!